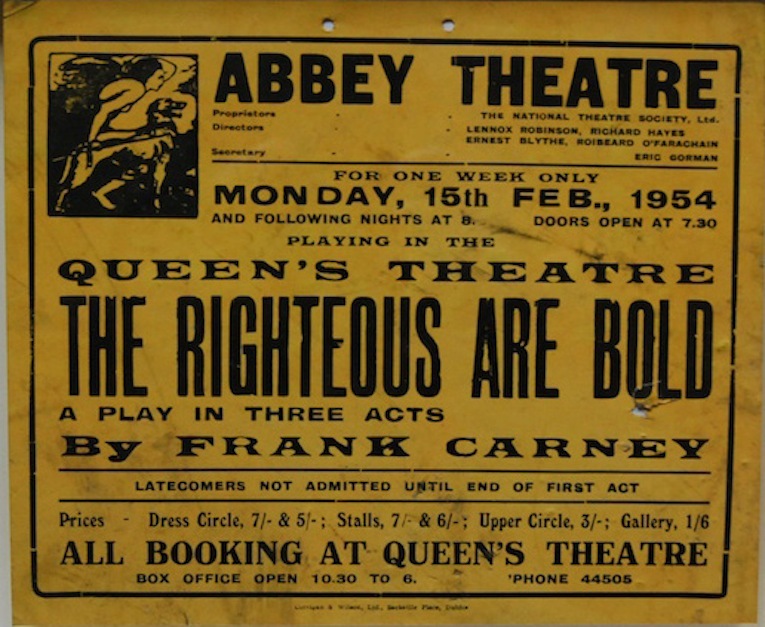 This poster advertises a run of The Righteous Are Bold by Frank Carney. It was the most performed play in the Abbey Theatre (which was temporarily housed in the Queen’s Theatre). Now largely forgotten, the play was hugely popular in its day because it featured the first exorcism to be shown on an Irish stage. The plot concerns an Irish emigrant returning home from London who is possessed by some ‘evil’, and the ensuing battle between scientific, pagan and Catholic beliefs as to how it should be removed. It was performed 245 times, 96 of those on its first run in 1956.